In worship we have been focusing on the different images the Bible gives of what the Church is and can be. The Church is the body of Christ, it is those who are called out (ekklesia), it is a family, it is the bride of Christ. Each of these images calls us to be greater than ourselves. We are to rise to the calling Jesus has given us: be his body, be his family, reach the world. These images are incredibly important as they speak to what we are expected to attain. There is another image for the Church, though, that does not speak of our aspirations but speaks of our most basic selves. It is the image of the Church as Jesus’ flock. As a flock, we have a singular identity: to be his and to follow his guiding. 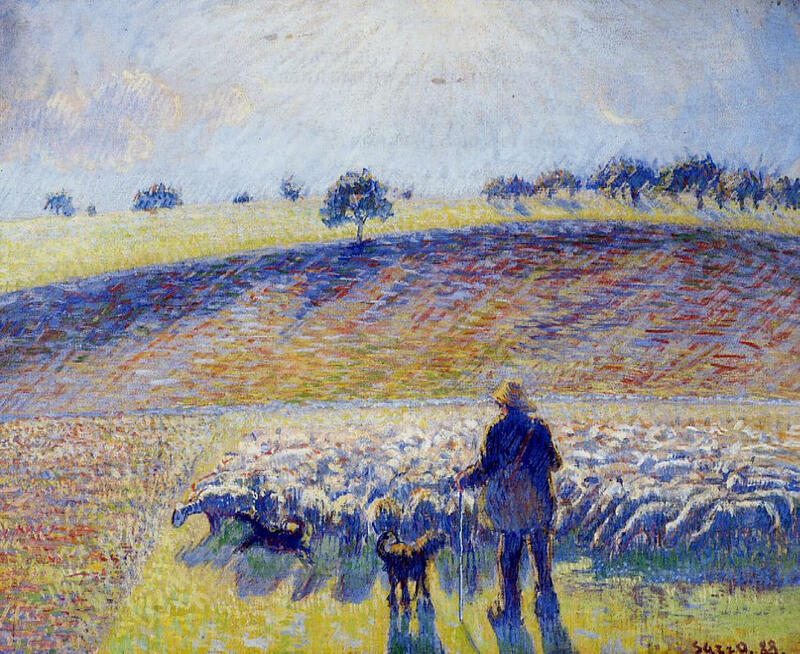 We have a reproduction of this Camille Pissaro painting (seen below) hanging over the fireplace in the Parlor. It reminds us of what it means to be a flock. We stay together, we are willing to be close with one another, and, most importantly, we are not in charge. We are the sheep who trust we have a Good Shepherd who is in charge. Aspirational images are important for pushing us but sometimes we simply need to rest in the comfort of knowing we are simple sheep who are cared for by the most gracious shepherd we can imagine. As we all know, sheep are not famous for their smarts and, even though they are cute at the beginning, they are not necessarily known for their looks either. They are humble creatures who rely completely on another for guidance and protection. What a comfort it is to realize that we don’t need to get smart enough or attractive enough to be worthy! We simply need to trust in the care of Another who guides and protects us. So, church family—flock of Christ, fellow sheep—may Jesus guide you this day and may you feel both the closeness and the protection of being in a flock as you rest in his care today.